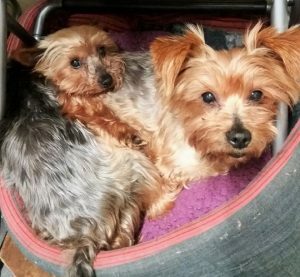 Timmy and Tipsy are a pair of extremely bonded, tan and black Yorkshire Terriers, who are in a foster home in Somerset through Dogsfriends. 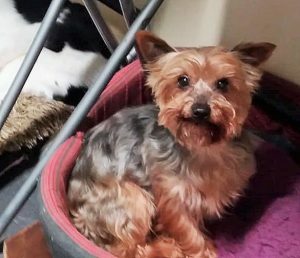 Timmy (male), the smallest at 4kg, is 10 years old, whilst Tipsy (female), who is slightly bigger at 6kg, is 8 years old. Both dogs are incredibly loving and really enjoy human company, as well as being good with other dogs. They have fantastic temperaments and love racing around the fields. Timmy and Tipsy previously lived on a farm and were always off lead. 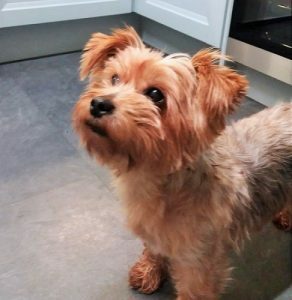 They’re still getting the hang of wearing harnesses and leads, so they need an owner who will be patient and kind about this while they learn. Of the two, Tipsy is more outgoing and inquisitive than Timmy. 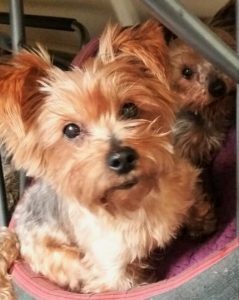 As they are a bonded pair, they are looking to find a forever home together. A home with a large garden would be wonderful for them and particularly one in the countryside or a quiet area. They’re not used to traffic and tarmac, and would love it if they never have to be! Please say you saw Timmy and Tipsy on the Oldies Club website.